Ok, call me obsessive - I've made pizza at least once a week ever since I found my perfect pizza crust recipe. 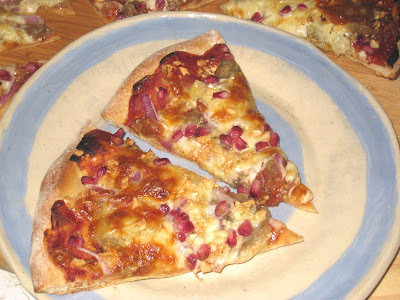 I've been mastering the crust and playing around with sauces and toppings, and I have more to report. The main thing I have learned I got from watching Adam Gertler's show "Will Work for Food" on the Food Network. I would provide a link to their site, but they have loud annoying videos that load automatically, and I will not inflict those on anyone, including myself. It's not a show I normally watch, but when I saw that he was going to be working with champion pizza thrower Tony Gemignani at Pyzano's Pizzeria I decided to check it out. I thought I might learn a tip or two that would be helpful. And I did. After they made the dough, they started forming it into balls so they could put them in a refrigerated room overnight. At one point, Tony warned Adam that they should move faster because the dough was starting to rise. That made me sit up and take notice. Every recipe I've seen says to cover the dough and let it rise until it's doubled in size, and then either use it right away or put it in the refrigerator or freezer to save for later use. This was the first I had heard that you might not need to let it rise first. I knew yeast did not die in the cold (or you wouldn't be able to freeze it), but I didn't know that it would still rise. Apparently, refrigerator temperature isn't enough to stop the rising process, just retard it. A quick google search confirmed that many pizza makers, professional and amateur, actually prefer to let their pizza dough rise slowly in the fridge - the longer rise causes more alcohol to develop, which adds to the flavor. It also improves the texture of the dough. So a few weeks ago I made up a batch of the dough, divided it in half, and put each ball into a plastic bag (after covering it lightly with flour). I put the bags into the refrigerator and went to bed. The next morning, I woke to two beautiful balls of dough that were about twice the size as when I had put them in. I wanted to take them out and play with them right away, but I had to go to work. The whole time I was at work, all I could think about were those two beautiful balls of pizza dough just waiting to be made into pizza. I rushed home and pulled one of the bags out and put it on the counter to warm while I prepared the sauce and the toppings. When I was ready to form the crust, I found that it was much easier to manipulate into shape than when I let the dough rise right after mixing it. And the texture of the cooked crust? Crispy and chewy at the same time - pretty near perfect. The next day I cooked up the other dough and it was just as good. So now, at least once a week I will mix up a batch of pizza dough and throw it in the refrigerator until I am ready to make the pizza. Without the rising time, it takes less than half an hour to throw together, which means I can mix up a batch in the morning and let it rise while I am at work, and by the time I get home it's ready to go. 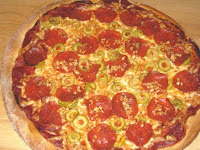 I used fresh mozzarella on this pie, along with what have become my signature green olives and garlic. 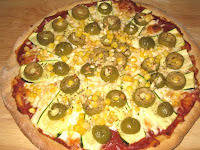 Thinly sliced zucchini and corn have also become favorites - corn fresh off the cob adds a crunchy sweetness to this pie. For the sauce, I sauted a little bit of onion and garlic in olive oil. I seasoned it with salt and pepper to taste, then added a can of tomato puree and dried thyme. I let it cook for about 20 minutes, then let it cool down before putting it on the pizza crust. I called this my "antipasti" pizza. I roasted an eggplant in the oven, then peeled and mashed it with some balsamic vinegar. 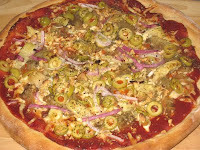 I spread it over the pizza just after the sauce and cheese, then added green olives, artichoke hearts, red onions and, of course, garlic. It was tart and salty and smooth and tangy, in a word - delicious. The other thing I have learned is something I read on a cooking newsgroup. It's not necessary to cook the sauce before you put it on the pizza - it cooks in the oven. So for this pizza I seasoned the sauce and spread it pretty much right out of the can, then sprinkled it with the oregano and basil. I have to say it was just as tasty as the precooked sauce, and cut down on the prep time that much more. I've been making it this way since. This is the closest I have come to a traditional pizza. I had meant to just use sauce, cheese and pepperoni, but I had sliced the green olives and chopped the garlic before I could stop myself. This has been my least favorite pizza. I remembered too late that I don't really like pepperoni. But it was still pretty good and I had no trouble getting rid of it. I haven't really experimented that much with meat toppings, but I love all of the vegetables so much that I'm not missing it at all. Given how much of it I'm eating, I want to keep it as healthful as I can. Oh, and those slices up at the top? Eggplant with a little bit of the artichoke hearts, red onion and garlic, topped off with pomegranate seeds I had bought for another use but seemed like a good idea. It was - they provided a burst of sweetness that complemented the savory eggplant.